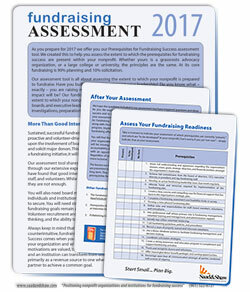 Download our free fundraising assessment tool. Whether your fundraising for a grassroots advocacy organization, or a large college or university, the principles are the same — fundraising is 90% planning and 10% solicitation. Make this the year you grow your fundraising program. Our simple three-page tool will help you assess your organization’s readiness for a fundraising campaign. Use the results to drive your discussion and planning.